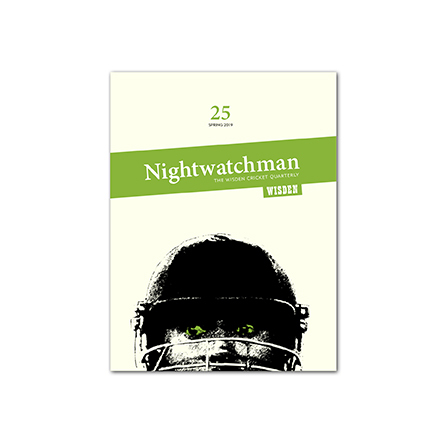 Issue 18 of The Nightwatchman is out now and available to buy here. I’m looking out of my Kia Oval office window as preparations for the ICC Champions Trophy go on apace. The murmur of mowers, the banging of builders, the one-two, one-two sound checks, and the palpable and growing excitement all point to the fact that a big event is about to take place. And then, a much bigger event takes place. Young girls attending a concert in Manchester are targeted and killed in a terrorist attack. We’re almost inured to these atrocities. We pride ourselves on our stoicism; in our ability to keep calm and carry on; to dust off the gallows humour; to show solidarity with our hashtags, our balanced views and our Britishness. But this one is different. My cousin’s girl was there, her friend’s dad still in hospital, body shrapnel-pocked. A friend of a friend is still missing. And there’s only one thing that means. And the greater-than-usual impotent rage this time around is not just because there’s a personal link. It’s because it’s the slaughter of innocents, people who hadn’t yet had a proper go at life. Utterly senseless, utterly stupid. So we hang on to the wreckage, to the things we hold dear. The big things – friends, family, love, a life well-lived – and the fripperies, the meaningless things that mean so much, that distract us from reflecting on what this world is becoming. For those young kids it was Ariana Grande; for many of us it’s cricket. Watching it, playing it, reading about it, imbuing it with significance. This issue of The Nightwatchman has been finalised against this backdrop. We hope we manage again to bring some joy into your lives, to entertain you for an hour or three, to make you reflect, to discover, to laugh and to rejoice that this thing we all love has the capacity to enthrall us still. Within these pages, there is poetry, fiction, reminiscence, rumination, whimsy and lots of lovely pictures. We hope there is plenty in there to make you smile. I’d also like to pay tribute here to Charlotte Atyeo, who leaves The Nightwatchman after this issue. It was Charlotte who came up with the name, who brought the team together, who generated so many ideas, who – with infinite patience – dragged us kicking and screaming to every deadline, who is common-sense personified, and whose editing is as good as it gets. If The Nightwatchman has its faults, they have not been of her making. I’m not sure what we’ll do without her but, in keeping with the theme of this piece, we’ll soldier on.